A desktop diagramming app perfect for mid-sized businesses. Help your employees make quick diagrams, workflows, idea sketches and more. SimpleD has a simple user interface so nobody has to spend lots of time reading a manual. The hand-drawn look keeps ideas and messages clear. SimpleD comes with over 500 shapes, and there are more free downloads on the website. So don't cloud presentation visuals with "polish." Leave that for the specialists. Keep things clear with SimpleDiagrams. Easy and simple with enough features. Pros: Easy to use. Great selection of shapes and icons. Doesn't go wrong or crash. Cons: Can't have multiple files open at once, although each file can contain man diagrams in separate tabs. Overall: I run training courses and write user manuals. Simple Diagrams contains all the features I need. Much easier to use than Visio or PowerPoint. Cheap enough for my business to purchase without a director's signature. Great support from the author, Daniel. Great selection of shapes by default and more libraries available quite cheaply, plus you can import your own shapes. The only downside is that the shapes are slightly cartoonish, which is perfect for schools, manuals, training, presentations, etc, but some people may find it too informal. Thanks for your thoughtful review, Matt. Much appreciated. Note that you can pull in any SVG image you want that has a cleaner look (I often recommend users to search on IconFinder.com). But yes, I should do more to make full libraries of "clean" shapes available (Right now there's just one). Suggestion noted! I Like it.... a lot! Cons: The scroll up / down bar is limited - for example if your flow chart is bigger than the screen size offered you either have to reduce the size or omit information. Overall: The programme Simple Diagram was introduced to me by a work colleague as I needed to create some work flows. SD offers a free trial for seven days, however, after a day I was happy to download and purchase the software. Easy to download and incredibly user friendly - this is a handy tool to have if you're heavily involved with presentations and supplying work aids. Thanks for the review, Salman. I'm glad you find SimpleD easy and friendly! Note that you can press space bar to get a "grab" cursor and pan through your diagram that way. Also, new in version 4 is the "quick nav" in the lower right corner of the screen, which allows yet another way to move around your document quickly. I noticed you didn't put any stars for customer support. Note that if you contact support, you get me, and I try to answer all support emails within a day. I hope if you ever do contact me, you're able to come back and add five stars on that one. Does exactly what it says: It's simple to create simple-looking diagrams. Perfect! Pros: The neat and hand-drawn appearance of the conveys informality that generates discussions with clients, implies draft status, and makes material less intimidating. There's energy in the diagrams that something more formal wouldn't have. The ease of use is absolutely terrific. Even the curve drawing tool, difficult in most other packages, it just click and drag to stretch into the shape you want -- it's so easy! Cons: There are two things main things I wish were better: The first is that if you stretch to enlarge an arrow drawing the arrow head is stretched and distorted. The big arrows are drawings and distort just like drawings. I wish they were somehow smarter. The second is that if you use a half-dozen boxes of a certain type, they're going to be identical. When you apply a certain hatch pattern to them, the pattern will be identical. This makes the drawings look a little less hand-drawn. I work around it by rotating the boxes, flipping them, or choosing similar shapes to mix it up a little. Overall: It's quick and easy to create informal, accessible drawings for discussions with clients. Comments: I am ideas person! Love mind mapping - not outlining! People who have projects that are not linear - but very associative - where components are interconnecting in a way that writing paragraphs and descriptions about concepts gets too long and you lose people! Visuals are worth a thousand words! It helps me put the macro then the micro together and to share the concepting with others! CUTE iconography! Only "cons" to list, if there are any - I wish there were more people and computer icons. Like different age group demographic icons: moms, older people, students, business person, and the stuff they use in daily life - car, cellphone, ipad, computer, maybe a cool set of grunge quotation mark icons, like the brackets - love those! In sales process we are showing people and the things they use - how it makes their life easier - so having that visually helps to convey the interactivity. :) That's why. Really nice boxes and grunge sketch look - awesome!! I will check out the video and other components available for the upper level subscription. Very cool. Will incorporate some of this into my Prezi presentation! Fantastic tool. WoW, I was urgently looking for something I do not know and I found this! Overall: just exactly what would you in need of, an enterprise architecture / Business Plan demonstration / Business Process Automation / Operational Performance Management / Workflow / Service Catalogue .. you name it ... it just puts a lot of condensed thoughts into a simple diagram! Genius! Recommendations to other buyers: buy the software and contact Dan. 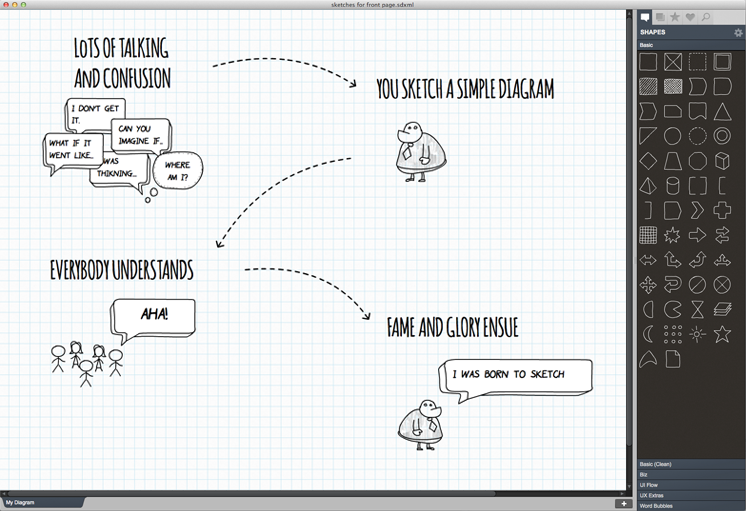 Overall: SimpleDiagrams is fun to use, but it is by no means a program for passing time. If you want to create graphics that can be used in all kinds of presentations, this is the one to go for. Not only is it a quick learner's app, but it is also expandable in terms of artwork. And the support provided by the creator is second to none. Recommendations to other buyers: My review says it all. Thanks for your thoughtful review, Thomas. I'm glad you've found the app helpful! Fantastic! Love this! Makes quick work of my presentation pitches! Overall: I love this product! I use it when I need to quickly present concept-ing to a group, or fellow collaborator, and just want to use photo I pull from the web, the arrows, people icons, etc. - quickly conveys the project flow and function - roles of those involved. Love this! MAKE even MORE cute icons and people ! I would purchase them asap as an upgrade package! Very well done toolkit for creatives, thank you! Pros: The hand-drawn appearance of icons. Cons: Teeny niggle is blurriness of some menus (e.g. Finder) on Mac. Overall: Simple Diagrams is great. Perfect for when you want to convey a serious message with a light touch. It's easy to use and gives diagrams and presentations a fresh, engaging appearance. Only teeny-tiny niggle is some of the pop-ups are a bit blurry on my Mac. However, this hasn't stopped me using and loving SimpleDiagrams. Thanks Liz! So glad you find the app useful. Based on your email to me, sounds like that blurry issue was from a past version. Let me know if you have any other issues using the app. Comments: I have been using SD for a long time now - since version 1. I've upgraded with every release so far. I consider it an essential part of my graphics toolkit. It is fast, lean, and has combinations of unique shapes and backgrounds that enable me to make distinctive sketches that could take more time in other software, like Visio (which I also have and like). The customer service provided by Daniel McQuillen is superb. Every question I have ever asked has been quickly responded to. My suggestions might or might not be implemented, but they are always received with respect. I can't ask for better. And the price makes this tool affordable for me. This is a piece of software I strongly recommend - without reservation. Best fast-making, great-looking & explain-everything-on-screens tool. Pros: Easy to use, customizable, stable tool. The fact that you can create your own libraries is best for me. Cons: So far I found nothing to complain about, and I am a user since the first release. I am not considering this as a constraint - but you need to accept this app as not a standalone one but you need Adobe Air. Overall: Time saved to create simple & fast clear picture with info i wanted to share. Excellent software. Easy to use. Intuitive. Pros: Easily start doing the most important thing: create a model of your ideas that you can rapidly share and put to the test. Cons: Would like have automatic lines showing up to help align objects easily. Pros: Easy to use and interesting shapes make it different from Visio and other diagramming tools, a more "hand drawn" style. Cons: A small thing, drag with the control key pressed does not copy the shape ;) - yes, I know it is a powerpoint/.. thing, but already present muscle memory means that it would speed up diagram creation. Pros: The software performs as expected. Easy to use. Love it. There really isn't anything on the market that allows you to produce hand-drawn style imagery as easily. I used this to illustrate my most recent book - Unicorn Tears. Cons: Better image setup and export options. The new diagram dialog box needs to be clearer and the options need to be better explained. The export diagram box also could be friendlier and higher res export options should be available. Comments: It would be nice if the text stayed horizontal if we rotate an object. I may have missed this, but that is my initial thought. Will keep testing it. Extends the mind, prevents the mouth getting in the way! Comments: Finally, i have a way to share a "simple" idea with clients. In the fog of digital marketing, having clear diagrams has helped immensely, and in the first client side application, this software helped us land a major retainer client. I've upgraded, and its awesome! Glad to hear that simple and clear visuals are helping you communicate with your clients, Mark! Comments: After downloading the trial I didn't have to think twice to buy SD, or even wait, and it stayed in the dock. Not many apps do. SD is quick, easy, intuitive, fun, versatile and the custom shape capability opens up so much potential. I have already created a couple of sets a few days in to owning the software. I look forward to working with it in earnest. Super easy to use, straight forward functionality, stellar support! Comments: Did I mention the stellar support? Within minutes I was able to begin modeling processes and web page wire diagrams. A couple years back I had an issue with running it on my MacBook, but that all works great now. I've never experienced such timely, competent support with any other software product. Comments: SimpleDiagrams rocks! It is easy and fun to use, and has become an essential part of my workspace. I don't know how or why I ever lived without it! It is reasonably priced, flexible, and did I mention fun? Thank you for creating such a wonderful product! Comments: I'm not much of an artist which is why I really like this product. It's simple to use and offers an array of creative versatility to choose from. I like how the diagrams tend to stand out from other generic sketches on the web. Thanks Jeff! I try to keep SimpleD easy to use. Comments: I am in the process of launching my visual creative planning business and completely in love with Simple Diagrams. The software is easy to use and has such simple yet stylish design. I can't wait to use the software to help my clients soon. Any library for creating map ? Comments: Simple Diagrams is a very good and easy tool for use. How, I can not find any library or tool for creating the roads or junction of a simple sketch of map. See if later version can achieve this. Is simple, is complete, is very very beautifull application. I'm happy when use it. Comments: Have received numerous compliments on visually appealing style of the diagrams in my presentations. They "pop" on the screen, compared to typical powerpoint-style diagrams. Comments: Very handy solution with fun factor. Great concept (support of user libraries, SVG graphics). And an open minded and repsonive developer. I like it and learned to effectively use it in a few minutes. Comments: I like it. It does its job well and helps me get organized by having me write down my thoughts. I more easily remember what is going on. New to SD but really like it. Nice work. Comments: New to SD but really like it. I have not had time to dig deep, but make really nice informal flow charts. Comments: This is a tool that can make communication much simpler. Easy to use, reliable, and balanced price. Love this app for charts! Pros: It's so easy to use. The UI is great and very intuitive. It's super easy to brainstorm with and make flow charts.